Juvederm� is a smooth consistency gel made of hyaluronic acid�a naturally occurring substance in your skin that helps to add volume and hydration. Your healthcare professional eases Juvederm� injectable gel under the skin to instantly restore your skin's volume and smooth away facial wrinkles and folds, like your �smile lines� or �parentheses� (nasolabial folds�the creases that run from the bottom of your nose to the corners of your mouth). Almost 90% of all study volunteers who were treated with both Juvederm� injectable gel and another dermal filler� preferred Juvederm�! Juvederm� injectable gel is the first FDA-approved hyaluronic acid dermal filler that is proven to be safe and effective for persons of color. 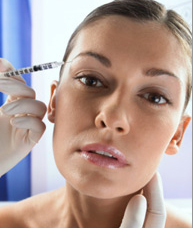 With Juvederm� the injection process takes only about 15 minutes and results are immediate. Plus, there's minimal recovery or downtime. So you can step into your doctor's office for treatment and step right back into your life. Juvederm� is indicated for injection into the mid to deep dermis for correction of moderate to severe facial wrinkles and folds (such as nasolabial folds). �The other dermal filler used in this study was ZYPLAST� dermal filler (bovine-based collagen).